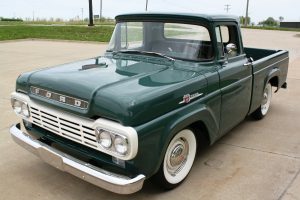 On their way to visit Martine at his house, Izzy and Juliana come across a 1959 Ford F100 pickup. A woman is driving, with two small kids beside her. She is having a smoke, holding the cigarette outside the cab, and when she finishes she tries to flick it back in the bed of the pickup truck. Later, at Martine’s, a party that Izzy would regret. When I came out of the cabana, Juliana was hanging on the edge of the pool, talking to Martine, who sat smoking at the table with a clever look in his face. I dove into the deep end. I ranked third among swimmers in my family, but I had merit badges to prove I knew my way around a pool. Juliana swam to me. For 10 minutes or so we were, at least in my mind, back in the creek, almost unaware of Martine, the sun crouching to squeeze through tree limbs, the subtle stench of rich-guy pool chemicals and wealth and slate surrounding us. Not so unlike the natural rub of creek scum, only a different flavor. Martine never came into the pool, but I felt his presence more and more. It began to feel like Juliana and I were swimming for an audience, dance partners in an aquatic audition of some kind, or primitive life forms jerking about on a microscope slide. The water was going sour and I pulled myself out, not knowing whether she would follow. I hadn’t the forethought to bring a towel with me from the cabana, as Juliana had, so I took my seat with Vic Martine and the Victor Electrowriter and simply air dried. The houseman showed up. Martine asked if we wanted something to drink. Juliana piped up from the pool, her face beaming, asking for a whiskey sour. I said I would have one too. “Truth serum for all!” Martine said. It occurred to me that he might already be drunk. I never saw it coming at the race track. Martine looked like he didn’t get it. They usually don’t. Then the fellow came with a tray of drinks and Juliana arose glistening from the pool, a freshly washed peach goddess. She wrapped herself in the thick towel she had brought from the cabana.